The second edition of the Eastern Partnership Think Tank Forum with the title ” A New Security Agenda for EaP. 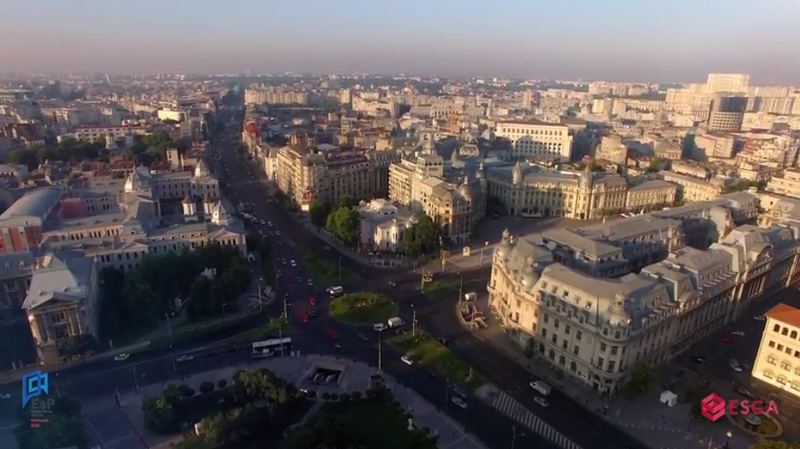 The Regional Approach” was held between November 14 – 16, 2018 in Bucharest, Romania under the auspices of the Austrian Presidency of the EU Council. The event was organized by the Experts for Security and Global Affairs Association (Romania) in partnership with the Institute for European Policies and Reforms (IPRE), the Georgian Institute for Strategic Studies (GISS) and New Europe Center (former Institute of World Policy (IWP)), implemented in cooperation with the Eastern Partnership Civil Society Forum (EaP CSF), funded by the EU from the EaP CSF re-Granting Scheme 2018, with the support of the Central University Library ”Carol I”, the Romanian Ministry of Foreign Affairs, and co-financed by Konrad Adenauer Stiftung (KAS). 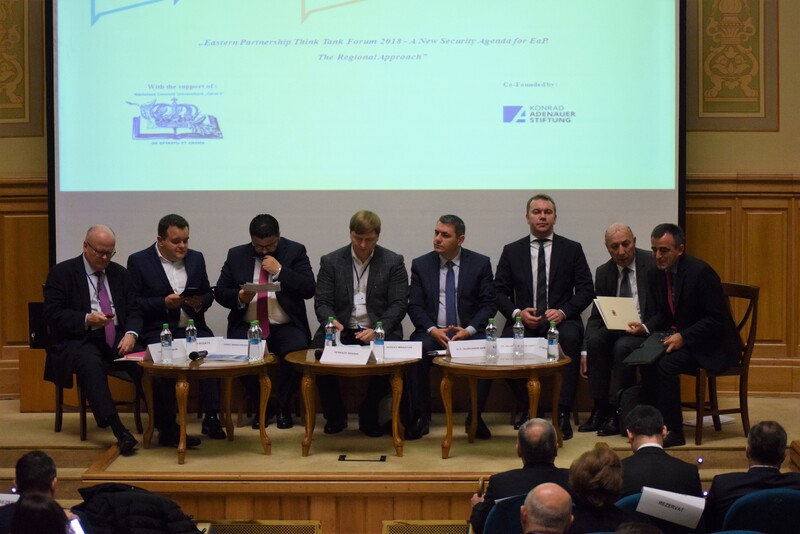 This year edition overall aim of the project was to contribute to the strengthening of the policy and advocacy capacities of EaP CSF network of think-tanks in order to propose a comprehensive vision (national and regional) over the EaP security agenda in the light of the EaP 2020 deliverables. 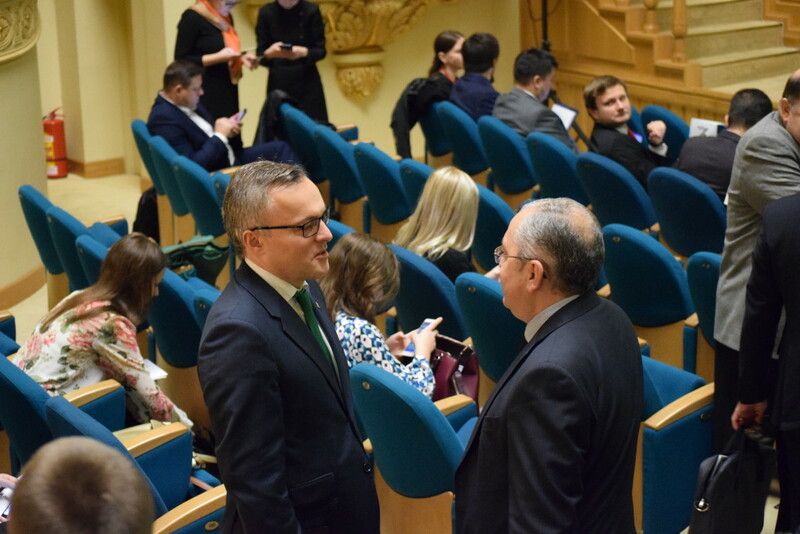 The event gathered throughout the two days around 100 participants from 12 countries, six Eastern Partnership countries (Armenia, Azerbaijan, Belarus, Georgia, Moldova, and Ukraine) and 6 European Union countries (Romania, Austria, Poland, Finland, France, and Slovakia). Strengthening the EaP experts’ regional perspective on security. Contributing to a more effective internal policy-making process within the EaP countries. Contributing to the advocacy efforts of the think-tank and CSOs community during the preparation of the agenda for the new European Commission. Enhancing the qualitative knowledge and the dialogue on the security sector of the Eastern Partnership (EaP). Offering recommendations which will contribute to EU agenda-setting efforts for the EaP region. The Opening session of the EaPTTF2018 was moderated by Angela Grămadă, president of the Experts for Security and Global Affairs Association. The welcoming speeches were addressed to the audience by Mr. Thomas Buchsbaum, Special Envoy on Eastern Partnership, Austrian Federal Ministry for Europe, Integration Ambassadors of the EaP Countries, Mr. Tudor Buzatu, State Secretary for the working apparatus of the Vice-Prime Minister for the implementation of Romania’s strategic partnerships and Dănuț Sebastian Neculăescu, State Secretary, Romanian Ministry of Foreign Affairs. 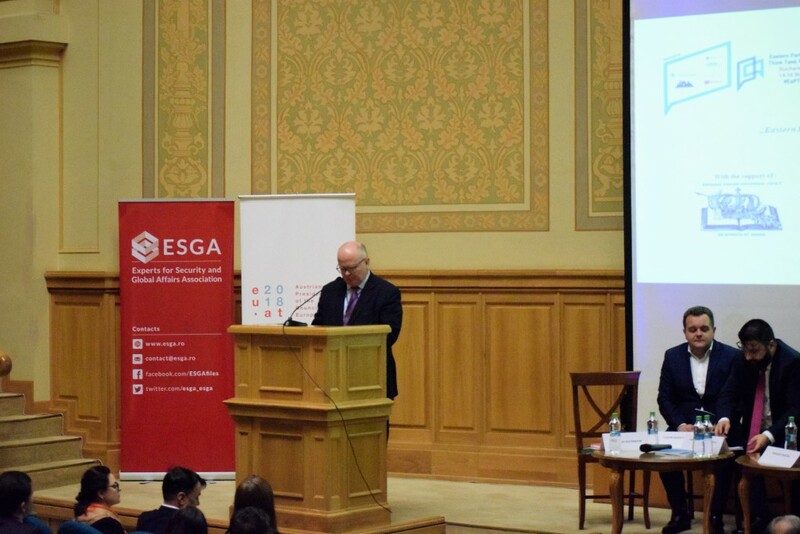 Welcoming remarks have been addressed to the public also by Hennadiy Maksak, Member of the Steering Committee of the Eastern Partnership Civil Society Forum, E. Sergey Minasyan, Embassy of Armenia in Bucharest, H.E. Mr. Nikoloz Nikolozishvili, Embassy of Georgia in Bucharest, E. Mihai Gribincea, Embassy of Moldova in Bucharest, E. Oleksandr Bankov, Embassy of Ukraine in Bucharest. “Security, among the cooperation with civil society is among Austria’s top priorities during our Presidency. Austria carries great interest in the Eastern Partnership. Further development of the Eastern Partnership was declared one of Austria’s EU Presidency key priorities. Already in the EU three presidencies, together with Bulgaria and Estonia, a democratic, stable, prosperous and resilient eastern neighborhood was emphasized to be key EU objectives. [..] Austria pursues a comprehensive, a multidirectional and a dialogue based Eastern Policy. In some of the partner countries, Austria ranges among top 5 investors and with all of them have very close business relations”. (Thomas Buchsbaum, Special Envoy on Eastern Partnership, Austrian Federal Ministry for Europe, Integration Ambassadors of the EaP Countries). The second session of the EaPTTF2018, dedicated to Georgia, was moderated by Iulian Groza, Executive Director of IPRE (Chișinău). The case study dedicated to Georgia was presented by Irakli Porchkhidze, Vice-president of GISS (Tbilisi). Among panelist we have had as guests following experts: Boris Navasardian, Yerevan Press Club, Country Facilitator for Armenian National Platform, EaP CSF, Yerevan, Ziya Guliyev, Center for Legal Studies, Country Facilitator for Azerbaijan National Platform, EaP CSF, Baku, Victoria Bucătaru, Executive Director, Foreign Policy Association (APE), Chișinău, Anton Mikhnenko, Member of the Expert Board, the Center for Army Conversion and Disarmament Study, Kyiv, Octavian Milewski, Political Scientist, Institute of Philosophy and Sociology, Polish Academy of Science, Warsaw. The second session of the event, dedicated to Moldova, was moderated by Sergiy Solodkyy, First Deputy Director, New Europe Center. The policy paper about Moldova was elaborated and presented by Dumitru Mînzărari, Associate expert IPRE (Chișinău). Following experts joined the panel: Andrei Paratnikau, Founder Belarus Security Blog, Minsk, Hennadiy Maksak, Chairman, Foreign Policy Council “Ukrainian Prism”, Kyiv, Kamil Calus, Senior Research Fellow, Center for Eastern Studies, Warsaw, Ana-Otilia Nuțu, Member of the Steering Committee of the Eastern Partnership Civil Society Forum, Expert Forum, Bucharest. The third session of the event was dedicated to Ukraine. The session was moderated by Irakli Porchkhidze. The case study on Ukraine was presented by Leonid Litra, Leonid Litra, Senior Research Fellow, New Europe Center. To this session have joined Ryhor Nizhnikau, Senior Researcher, Finnish Institute of International Affairs, Helsinki, Batu Kutelia, Vice-President of the Atlantic Council of Georgia, Tbilisi, Orsolya Raczova, Research Fellow, Globsec, Bratislava, Stanislav Secrieru, Senior Policy Analyst, EU Institute for Security Studies, Paris, Dmytro Shulga, European programme initiative Director at the International Renaissance Foundation, Kyiv, and Rosian Vasiloi, Security Analyst, IDIS Viitorul, Chișinău. On the second day of the EaPTTF2018 the debates were dedicated to Romania and to recommendations. The session dedicated to Romania was moderated by Kamil Calus, Senior Research Fellow, Center for Eastern Studies, Warsaw. The policy paper about Romania was elaborated and presented by our colleague, Mihaela-Adriana Pădureanu, Vice-president, ESGA. To this session joined Silviu Nate, Director, Global Studies Center, Lucian Blaga University of Sibiu, Claudiu Degeratu, Researcher at the National Institute for the Study of Totalitarianism of the Romanian Academy, Octavian Milewski, Political Scientist, Institute of Philosophy and Sociology, Polish Academy of Science, Warsaw. The last session – recommendations, was moderated by Leonela Leca, head of the Energy/Economy Department at ESGA Romania. Dumitru Mînzărari, Associate Expert, Institute for European Policies and Reforms (IPRE), Chișinău, Batu Kutelia, Vice-President of the Atlantic Council of Georgia, Tbilisi, Dmytro Shulga, European programme initiative Director at the International Renaissance Foundation, Kyiv, Mihaela-Adriana Pădureanu, Vice-president, ESGA Romania, Bucharest, have presented to the audience their policy recommendations. Implementation period of the Project is between 01 June 2018 and 30 November 2018 and the total eligible cost of the Project is estimated at EUR 21,840. EaP CSF Secretariat undertakes to finance 90% of the cost of the Project, i.e. EUR 19,656.